I’ve been in a dessert rut ever since I created my chocolate/peanut butter crunch. That one is so easy to make—I don’t measure, there’s no oven or stove time—while baking is so much more time-consuming. Well, now I’m in a new dessert rut. And it’s even easier than the crunch, which requires time in the refrigerator or freezer to harden. I made an almond brittle by mixing toasted, sliced almonds into the caramel mixture until I couldn’t add more almonds and letting that harden in the refrigerator. Delicious and a little bit virtuous (almonds are so good for you! ), albeit fragile. The almond-and-caramel combo reminded me of Cracker Jack, something I haven’t eaten in a long time but used to love. Could I recreate that??? 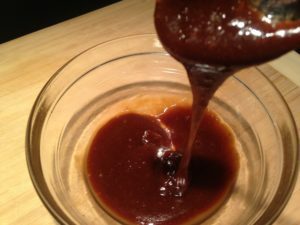 My first endeavor was a disaster—I made the caramel on the stove using coconut oil instead of margarine, and burned the sugar, which simply would not blend with the oil. I then looked up recipes online, and they all seemed way too complicated (more ingredients to measure plus oven time). So I tried again on my own, and figured it out. 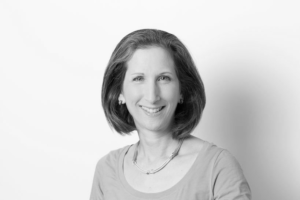 I’m addicted…as is my family…and now friends at the office, too. 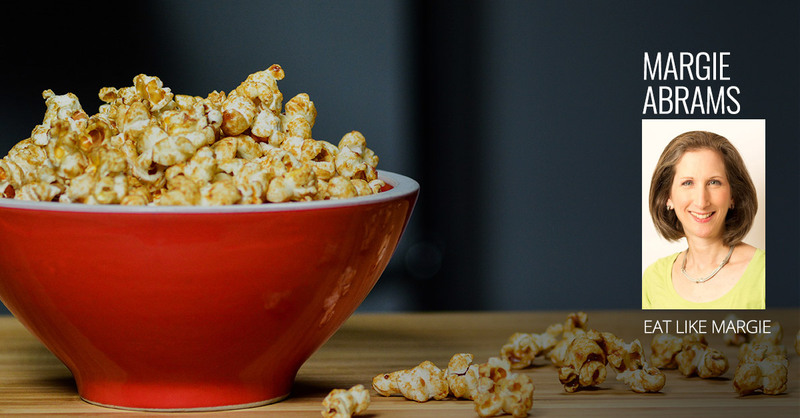 Yes, this is a sweet indulgence…but not too sweet, and popcorn is good for you! I pop my popcorn on the stovetop. 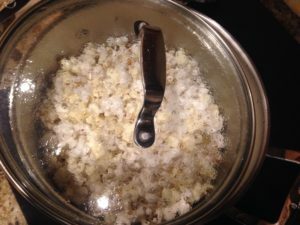 I don’t like the chemicals—and the health risks—of microwave popcorn, and air poppers throw out too many kernels with the popped ones. If you have a savory palette, scroll down to the end of this post. I have a suggestion for you, too. 2. Add popping corn and shake to spread it evenly over the bottom of the pot. 3. Heat on medium-high (level 7 of 10) until the corn starts popping. Then lower to medium (level 5). 5. Shake periodically to keep the unpopped kernels on the bottom of the pot. 6. When popping stops, remove from heat and remove the pot top completely. Total popping time is about five minutes. 1. Melt margarine in a microwave-safe bowl for 45-60 seconds (depending on the strength of your microwave). It needs to be hot enough to melt the sugar. 2. 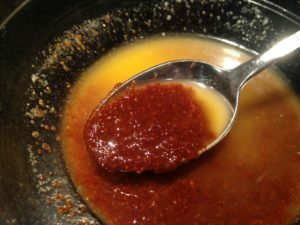 Pour sugar into the margarine (which may bubble a bit at first), and stir vigorously until the two ingredients are smoothly blended into a thick syrup and not grainy. This can take a few minutes—do keep at it. You may need to put the combo back into the microwave for a bit, but only do so in 10-second increments so you don’t burn the sugar (which smells awful, and tastes worse!). 3. 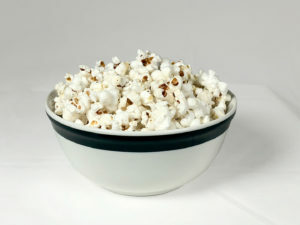 Use a soup spoon to drip the caramel over the popcorn and stir quickly to evenly coat. I like to mix one spoonful at a time so that no section of the popcorn becomes overly coated. 4. Transfer to a serving bowl and enjoy. * Transfer the popped corn to the bowl immediately after popping. * Before starting the next batch of corn, let the pot cool completely. Then wipe the insides clean to remove any popcorn crumbs. The corn won’t pop as well if you start over while the pot is still hot. If you have a savory palette: Shake on spices instead of just salt. My favorite is what I call our “egg blend,” which I used back when we ate eggs and never changed the name. I mixed up a batch in an emptied spice jar and now just keep it replenished. Just shake some over the popcorn after it’s popped, and mix to distribute. Add salt and pepper to taste if you like. Click here for more delicious spice blends to try.